Thanksgiving is a time when people travel back to their hometown for some good ‘ol turkey feast with their families. It’s also a time for bonding with siblings and hometown friends watching Thanksgiving horror movies. You rarely hear about Thanksgiving horror movies and more about Halloween-themed horror movies. Some of them are scary, but most of them are really campy and have something to do with turkeys. These underrated cinematic gems are great at keeping grogginess at bay after dinner. Alien Abduction – Caso McPherson – Incident in lake country from OMR on Vimeo. This found-footage television horror movie shows a family’s extraterrestrial encounters during Thanksgiving. The movie was made prior to the Blair Witch Project, which explains why many people were scared out of their wits, thinking what happened was real. You can watch the whole movie in the video above this paragraph. The movie tells the story of a college girl who tries to escape a group of social outcasts hunting her down on Thanksgiving. This movie gives audiences a clever and chilling glimpse into the deep and dark web. This psycho horror flick is a must-watch for horror lovers everywhere. Blood Freak is about Herschell, a junkie who works in a farm full of genetically-modified turkeys. The farm owner is the father of his girlfriend, Angel. He eats some of the meat, which unfortunately turns him into a crazy turkey-headed killing monster. He goes on to kill fellow junkies throughout the film, which was a strange way for anti-drug advocates to say “don’t do drugs”. This two-minute short by Eli Roth is a jolting addition to your otherwise boring Thanksgiving film collection. The short film appeared as a fake trailer in Robert Rodriguez and Quentin Tarantino’s Grindhouse project. The lead character is a slasher who kills high schoolers after the death of his sweetheart. 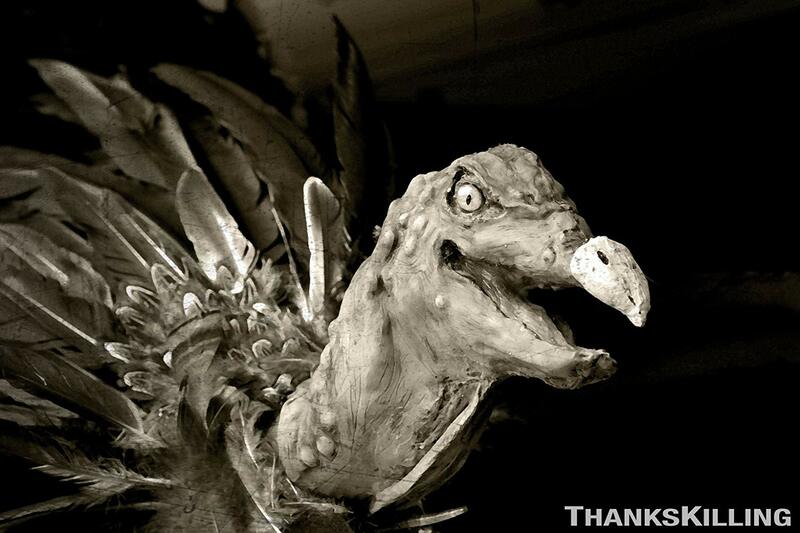 “ThanksKilling” follows five college students who come home for Thanksgiving break and Turkie, a nasty and murderous turkey who terrorizes them. The movie was distributed by Warner Bros. Pictures for YouTube distribution-only. Critics and audiences loved how bad yet enjoyable this movie was so they funded its sequel, which came out in 2013 – in theatres.